The somber prospect of tens of millions of environmental refugees associated with global sea level rise is not an uplifting note on which to conclude. It does, however, illustrate one profound example of the scale of the cryo-sphere and its integral role within the global climate system. It also points to an area of intensive current research, as all of the world will be touched by the evolution and fate of the cryosphere in the coming decades and centuries. The atlas of the world will be redrawn as coastal boundaries, navigable waterways, river systems, and population centers shift in the coming decades. For this reason there are concerted, globally integrated efforts to better understand and constrain cryo-sphere-climate processes and cryospheric sensitivity to climate change. For the question of sea level rise, this requires improved quantitative understanding of ice sheet dynamics and decadal-scale ice sheet variability. Of particular importance are ice-ocean interactions, fast-flow behavior in ice sheets (i.e., ice streams), and the subglacial processes that enable fast flow. Fundamental glaciological data are still sparse in large sectors of the polar ice sheets, as well as mountain glaciers, including knowledge of ice thickness, thermal regime, and subglacial conditions. It is difficult to apply hydrological and basal flow models to much of Greenland and Antarctica, where groundwater drainage, sediment properties, and other details of the subglacial environment are poorly known. Methods of parameterizing subgrid-scale basal processes in large-scale models are needed. 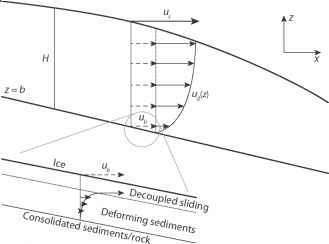 Similar physical and numerical challenges are involved in simulation of melting beneath floating ice and iceberg calving; there is no established "calving law," as the underlying physics and environmental controls are not fully understood. Improved coupling between ice sheet and climate models is also necessary. Several research groups have initiated this effort in recent years, but coupled models are still in early stages. Energy- and mass-conserving models that describe ice-ocean coupling will be particularly important going forward and will require regional ocean models that have skill in coastal and sub-ice shelf dynamics. In general, the mass balance fields simulated by climate models are not accurate enough for coupled ice sheet-climate modeling, nor can sophisticated atmospheric models be integrated over the millennial time-scales of interest for ice sheet evolution. However, the development of improved regional-scale meteorological and glacier mass balance models permits direct estimates of surface mass balance from meteorological models and offers a physically based method to simulate how these fields can be expected to change with ice sheet geometry. The challenge is greater for the mass balance fields and surface climatological forcing of mountain glaciers and snowpacks. Temperature and precipitation gradients are steep in complex terrain. The topography and the relevant meteorological processes are not faithfully resolved in even regional climate models, so some form of climatic downscaling is needed to prescribe mass balance fields for modeling of snow distribution and glacier mass balance in alpine regions. Current downscaling methods generally do not conserve energy or mass, and improved treatments are needed. There are different considerations for permafrost modeling, but they also relate to the resolution of the landscape and surface climate. The mean annual surface temperature that governs permafrost aggradation and degradation depends on local-scale vegetation, snow-pack depth, hydrology, and soil properties, which commonly vary over a spatial scale of meters. At present, global-scale permafrost models need to be interpreted "statistically" for a region (i.e., via a distribution of permafrost thickness in a given climate-model grid cell, based on the subgrid-scale ground cover and snow conditions in the region). There is intense interest in understanding the feedbacks associated with sea-i ce change, such as effects on polar cloud cover, ocean warming and stratification, and multiyear or decadal-scale sea-ice "memory"' Details of sea-ice rheology and the best way to model discontinuous, subgrid-scale processes in continuum models of ocean-ice dynamics are still being explored. Carbon fluxes between sea ice, the ocean mixed layer, and the atmosphere are another subject of great interest; algae and nutrients deposited on sea ice can create impressive plankton blooms when melting delivers these to the ocean, acting as a carbon sink, but the overall effects of changing sea ice on the global carbon budget are not yet clear. Similarly, deepening active layers in frozen ground and disappearance of permafrost at lower latitudes, along with the geomorphic response to this (e.g., altered hydrological drainage), have an unknown net impact on fluxes of C02 and CH4. Thawing permafrost terrain has the potential to be a significant, large-scale source of carbon to the atmosphere, exacerbating global warming. Insight into this will also help understanding of the potential role of permafrost in the unresolved question of carbon sinks during the glacial period. Recent efforts have focused on the question of thresholds and reversibility of different aspects of cryospheric response to climate change. This includes aspects of ice sheet and sea-ice retreat, as well as effects of freshwater forcing on ocean circulation. This is an active area of research, focused on nonlinearities in the climate system and concerns about potential long-term commitments in the cryospheric response to anthropogenic forcing of the climate system. This list of future research directions is far from comprehensive. There are many more priorities within each aspect of cryospheric science. With the notable exception of sea ice, many aspects of the cryosphere have only recently been considered to be fully contributing, interactive components of the global climate system. This means that there are many exciting possibilities to improve coupled cryosphere-climate models at regional and global scales. Satellites are providing a remarkable view of the cryosphere. In many cases, observations are pointing out important new directions for theoretical and field-based studies, and these different strands of research will combine to better illuminate the role of the cryosphere in the global climate system. Ablation. Snow or ice removal through meltwater runoff, sublimation, wind scour, avalanching, or glacial calving (mechanical fracturing; see calving). Ablation zone. The area of a glacier where annual ablation exceeds annual accumulation, giving net loss of snow and ice. Accretion. Increase in ice mass by freezing of basal or surface water. Accumulation. Snow or ice added to an ice mass via snowfall, frost deposition, rainfall that freezes on/in the ice mass, refrozen meltwater, wind-blown snow deposition, or avalanching. Accumulation area ratio (AAR). The fractional area of a glacier represented by the accumulation zone at the end of the summer melt season (AAR = accumulation zone area/glacier area). Accumulation zone. The area of a glacier where annual accumulation exceeds annual ablation, giving net accumulation. Active layer. The layer of seasonally frozen ground in contact with the atmosphere, usually with reference to permafrost terrain. Active layer depths vary from centimeters to several meters. Aufeis. See icing. Also known as naled. Bergeron process. Process by which ice crystals grow at the expense of cloud droplets in mixed clouds, through selective vapor deposition onto ice crystals. This process is driven by the lower saturation vapor pressure over ice crystals, relative to water droplets. Clathrate hydrate. Gases (e.g., methane) trapped in an ice-crystal "shell" or "cage," found frozen in permafrost and in shallow seafloor sediments (e.g., cold continental shelf environments). Clausius-Clapeyron relation. The thermodynamic relationship between pressure and temperature, which underlies both (i) the pressure melting point depression in ice and (ii) the increase in saturation vapor pressure with temperature in the atmosphere. Drift ice. See pack ice. East Antarctica. The portion of Antarctica that lies mostly in the Eastern Hemisphere, east of the Transant-arctic Mountains (Ross Sea sector) and the Thiel Trough (Weddell Sea sector). Most of the East Antarctic ice sheet is grounded above sea level, on a contiguous landmass. Equilibrium line altitude (ELA). The elevation at which seasonal snow accumulation balances ablation on a glacier. Fast ice. Sea ice that is frozen to the shore. Also called landfast ice. Firn. Multiyear snow that is in transition from meteoric snowfall to glacier ice. Firn densities typically range from 550 to 830 kg m-3. Floating ice. Ice that is floating in water. Lake, river, and sea ice form from in situ freezing of the water. Once initiated, meteoric precipitation (snow or frozen rainwater) adds to the ice mass. In contrast, floating glacier ice (e.g., in ice shelves) is advected/transported to the water body from a terrestrial ice mass. Icebergs are fragments of glacier ice that have broken off and are now floating. Frazil ice. The early stages of small ice crystal growth in rivers, lakes, and oceans, when waters are supercooled and turbulent. Frost. Deposition of ice on a surface, forming directly from water vapor. General circulation model (GCM). Three-dimensional model of atmosphere or ocean dynamics. Conveniently, GCM also stands for global climate model, and this acronym is now used interchangeably. Glaciated. A region or landscape influenced by past glacial (e.g., Pleistocene Ice Age) cover. Glacier. A perennial terrestrial ice mass that shows evidence of motion via gravitational deformation. Glacier ice. Polycrystalline ice formed from snow meta-morphism, with a density of 830 to 920 kg m-3. The transition from firn to ice at ~830 kg m3 is associated with bubble close-off. Glacierized. A region or river basin where glaciers are currently present. Glacier mass balance. The overall gain or loss of mass for a glacier or ice sheet over a specified time interval, typically 1 year. This can be expressed as a rate of change of mass (kg yr-1), ice volume (m3 yr-1), or water-equivalent volume (m3 w.e. yr-1). See also specific mass balance and surface mass balance. Grounded ice. A glacier or ice sheet that is resting on bedrock or sediments. It can be grounded either above or below sea level. Ground ice. Ice in permafrost or seasonally frozen ground. Also known as soil ice. Grounding line. The transition zone between grounded and floating ice. Heinrich event. Episodic surge events from the Hudson Strait sector of the Laurentide ice sheet. Ice Age. See Pleistocene Ice Age. Iceberg. A fragment of a glacier or ice shelf that has broken off (see calving) from the main ice mass and is now floating in a lake or sea. Ice cap. A dome of glacier ice that overwhelms the local bedrock topography, with the ice flow direction governed by the shape of the ice cap itself. Icefield. A sheet of glacier ice in an alpine environment in which the ice is not thick enough to overwhelm the local bedrock topography, but is draped over and around it; glacier flow directions in an icefield are dictated by the bed topography. Ice sheet. A large (i.e., continental-scale) ice cap. Ice shelf. Glacier ice that has flowed into an ocean or lake and is floating, no longer supported by the bed. Icing. A thin sheet of ice that forms from refreezing of meltwater (e.g., superimposed ice on glaciers) or from up-welling of groundwater to a cold subaerial environment. Icings can have large horizontal extents of several square kilometers in the latter case. Also known as aufeis or naled. Katabatic wind. Downslope wind resulting from gravitational drainage of cold air masses. These are common on valley glaciers and the flanks of ice caps and ice sheets. Lake ice. Floating ice on a lake, initially formed by freezing of the lake water. Last glacial maximum (LGM). Period of maximum extent of the last Pleistocene glacial ice sheets, ca. 21,000 years ago. Massive ice. Lenses or wedges of highly concentrated or pure ice in frozen ground. Milankovitch cycles. Variations in the Earth-Sun orbit on timescales of 104 to 105 years (tens to hundreds of kyr), which lead to changing seasonality and latitudinal distribution of insolation. These orbital variations drive the glacial-interglacial cycles of the Quaternary period. Mixed clouds. Clouds from 0°C to about -40°C, with a mixture of ice crystals, supercooled water droplets, and water vapor. Neve. The accumulation area of an icefield, often associated with thick layers of firn. Pack ice. Drifting sea ice that is consolidated. Pancake ice. Discrete, rounded pieces of sea or lake ice up to a few meters in diameter. Periglacial. Terrestrial environments influenced by glacial or permafrost activity. Permafrost. Perennially frozen ground, technically defined as ground that is at or below 0°C for at least 2 years. Proglacial. The environment adjacent to a glacier, also referred to as the glacier forefield. For most contemporary glaciers, the proglacial environment is the recently deglaciated region where vegetation has yet to take hold. Orbital variations. See Milankovitch cycles. Pleistocene Ice Age. The last ~2.6 million years in Earth history, characterized by at least 40 advances and retreats of glacial ice (glacial-interglacial cycles) over much of the world, in particular the Northern Hemisphere land mass. Also known as the Quaternary Ice Age. River ice. Floating ice on a river, initially formed by freezing of the river water. Sea ice. Floating ice formed by freezing of seawater. Snow. Ice-crystal precipitation that accumulates on the surface. Snowball Earth. Episodes of complete global glacier and sea-ice cover in Earth's distant past. Specific mass balance. The area-averaged mass balance rate on a glacier (kg m-2 yr-1), often expressed as the rate of water-equivalent thinning/thickening (m w.e. yr-1). Subglacial. The environment beneath a glacier, at the ice-bed interface. Supraglacial. On the surface of a glacier. Surface mass balance. The mass balance at the atmosphere-glacier interface, associated with net snow accumulation minus surface ablation. This is often referred to as the glacier's mass balance, but strictly speaking mass balance also includes the gain and loss of ice in englacial, subglacial, and ice-marginal environments (i.e., associated with calving). West Antarctica. The low-lying portion of Antarctica that lies mostly in the Western Hemisphere, west of the Transantarctic Mountains. Most of the West Antarctic ice sheet is grounded below sea level, on a network/ archipelago of islands/tectonic blocks separated by deep troughs.